The Comedy Magic Of Robert Baxt Will AMAZE Your Guests & Keep ’em Laughing! Watch This Video & See How The Los Angeles Comedy Magician Robert Baxt Will Make Your Event Unforgettable!! Comedian Magician To The Stars! Have you ever had your funny-bone tickled and your mind blown at the same time? Welcome to the laugh-out-loud entertainment of Los Angeles comedy magician Robert Baxt. Winner of the FISM Trophy for Comedy, first prize in the International Brotherhood of Magicians National Gold Medal Stage Competition, TV Credits, performances, and lectures around the world show that he knows what he’s doing. Looking to add amazement & laughs to your act? Check out the official Robert Baxt magic shop and choose from a variety of comic magic tricks and DVDs. These are hilarious workers from one of the top comedy magicians today. Comedy performances, corporate entertainment, kids’ magic shows, trade shows, celebrity roasts, and any occasion where amusement is what you’re looking for! Anytime is the perfect time for Robert’s brand of merriment. 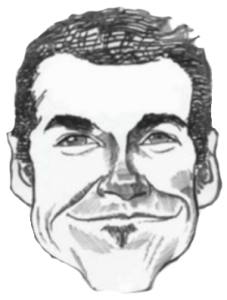 When you want that special something, the one magic ingredient is always…ROBERT BAXT! You can be funny too! These are tried and true comic routines and products from a renowned working comedy magician. Are you looking to add something creative to your act? Check out all of Robert Baxt’s magic tricks, gags, jokes, and funny bits of business. Take your show to the next level with easy-to-do magic loaded with hilarity. Make your party or event EXTRA great and STRESS-FREE for you! Why wait? With so many hundreds of great reviews, Robert’s schedule fills up quickly; sometimes months in advance. It’s important that your guests have the time of their lives. Robert is the comedy entertainer that you’ve been looking for! The Plate Spinning Circus Act! 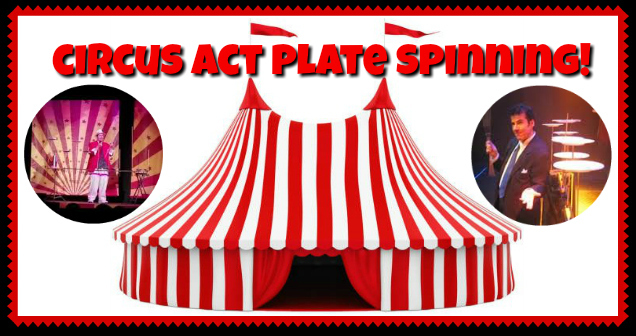 The classic plate spinning act is just like something you might have seen on TV on the old “Ed Sullivan Show”! Robert was taught how to spin plates when he was a kid by veteran performer Al Flosso who had been on the Ed Sullivan show many times. Robert has the long table with the sticks and does the act of running back and forth frantically trying to keep the plates all going at once. A true crowd pleaser! And of course, if there’s any special executive or V.I.P. around, they can be worked into the act to make for the highlight of any show! TV consulting, movie consulting, commercials, commercial consulting. Do you want to take your show to the next level but don’t know how to get there? Are you disappointed with the reactions you are getting from the shows you do now? Do you feel you could do more, but don’t know what to do? Contact Robert today and your performance art will sky-rocket!